Did you have the best weekend ever? I sure hope you all got up early and watched Wills and Kate get hitched! ;) I know I did! Photos coming super soon! My weekend felt super long for the first time in awhile, and it was full of the people I love to pieces! Woke up with a huge smile on my face, and my yummy Almond Joy creamer is just making my Monday chipper! Sending you some cheer today! Remember to spread the love today... everyone deserves some Monday cheer, so let it start with you! I think every date with my boyfriend is the best. Sounds so boring I know, but I just love being with him. So even of we just buy a bottle of wine and take it home, and watch TV its all great with me. I just LOVE the time we spent together. I loved the Royal Wedding!! It was proper real love with them it seems!! Heartwarming to watch :-) Happy Monday!!! If I'm being honest, I've never been on a date before. And yes, I am 22 years old. Help a girl out here! I visited Cornflake Dreams - awesome blog! I also have a style crush on Zooey Deschanel. I also visited Yellow and Gray. Cutest kitties ever!! And Boyce Avenue was playing on the music player - love them! I stopped by "On the front Porch looking in" and she had some really cute pictures of things with a grey/yellow theme from Etsy. I also went to Lu3lu's Crossing and she had a nice quote about rain--gave me a good perspective when there are so many rainy days here lately! My favorite date ever was right after my boyfriend and I decided to be "official"...we went to a local sushi restaurant that had a nice, cool and quiet environment. I remember him not letting go of my hand until the food arrived, and then reaching for it again when the food was gone. He still does this today, and it always reminds me of our first date and how giddy we were! I have yet to be asked out on a date, so no cute date stories for me. A Nest for all Seasons - who knew baby chickens are so cute? Going the Distance - sounds like a fun weekend with friends! And a nice thank you to the military and military families. p.s. I made a post about Mingle Monday on my blog, just for you, Meg. Thanks for hosting :). 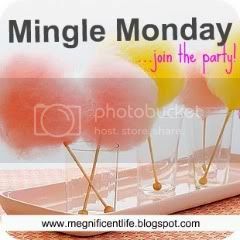 I am so excited for mingle Monday! My favorite dates were visiting Mitchell when he lived in Santa Barbara and I lived in San Diego. We had such a romantic time!! I visited Nest for All Seasons and saw her cute little chicks and chicken coop and I Dream Loudly and read about her weekend and getting to see her new little baby!! I forgot to mention who I visited AND didn't see the question! What's up with me today? I am now a new follower of High Heeled Life. Also visited, Yellow and Grey and I Dream Loudly (love the scan!). Question answer: My favourite was going to a little bar, playing some pool, choosing some jukebox songs and sitting all close :-) Basic but just lovely. Favorite Date: honestly, not one sticks out to me. Not because they aren't good, but I've loved so many. Our honeymoon was awesome, but a very specific date would be when Josh and I went to a Jack Johnson concert this last summer. When I think of Jack and his songs, I think of our relationship... so that was pretty special. Mingle-wise, I checked out Where Nest is Home (I might have to start being a follower), and I'm so jealous of her coup and chickadees! I also love a good color palette so I quite enjoyed On the Front Porch Looking In. I can't wait to hear how your party went last Friday! Hi! First I stopped off at Sweet Silver Lining, where she posted a great playlist that will get you out of those Monday blues! Then I went to A Nest for All Seasons where she talked about the chicken coop her hubby had built, then showed adorable pics of some chicks! Can we say, "awww?" Favorite date ever: Horseback riding with my husband. He is so handsome. I went to visit Going the Distance and sympathized with finishing out the school year! Then I went to On the Front Porch and loved the colors today. Totally gave me some good ideas for baby room! My favourite date was my first one with my husband - we played pool, went out for dinner and watched a movie. So nothing wild, but that great feeling of clicking with someone is what really makes the date. I visited Greer's Gossip and was entertained by her description of the current fashion in teenage prom dresses. Apparently tutus are involved. Gotta get back to my conference meeting, but will be back in a few hours to check out more blogs :) Happy Monday! I love romantic and sweet dates :) I'm obsessed with The Royal Wedding and I love seeing pictures and articles about it on everyone's blogs! I looked at I Dream Loudly, congratulations on the baby! I hope the chicks let you get some more sleep soon. My favorite date ever was probably the weekend that dh and I spent in Gatlinburg planning our wedding. It was just the two of us and, though we had no money, we felt like we were splurging just by getting to go. Desperately Seeking Starbucks: Her love of this country gets me all teary-eyed. I feel so full of pride when my fellow Americans appreciate the country they live in. She also opened her blog post with a great quote which I promptly copied down to save for later! A Little Bit of This & That: Michelle posted a great first date story of one of her friends. Those are the best to read because it makes you all warm and fuzzy inside. 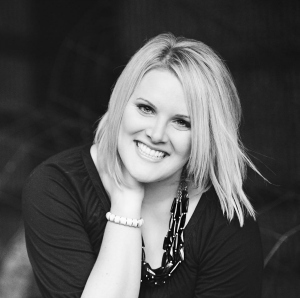 Michelle's blog definitely makes her readers keep coming back for more! Love it! stopped by lu3lus crossing--she has a great list of what she learned since easter. v cute. and LOVED on the front porch's post with grey and yellow! such a great color combo. Hmmm...my favorite date ever has to be when we went to the zoo. I love the zoo! I stopped by A Nest for All Seasons and I loved reading about her new chicks! I also stopped by I Dream Loudly and I loved her excitement about the sonogram she'd just had. I have been on some pretty fun dates it's hard to pick just one! A train ride on the Great Smoky Mountain Railroad, a visit to the Biltmore House, going to see various plays (Wicked being one of my favorites! ), picnics, and pizza/movie nights. No matter what my husband and I do, I just love spending time with my best friend! I visited Bless this Nest, A Little Bit of This and That, and Undercover Blonde.... cute blogs!! I visited Going the Distance-she went to see Water for Elephants and I can't wait to see that movie! I also visited Lu3lus Crossing-she had a lovely post about random things and I loved it! My favorite date was probably my first date with my husband. We went to an amusement park and I'm so glad we did something fun like that and kind of out of the norm. It was on that date that I knew I would marry him! Best date ever...hubby surprised me by taking me on a picnic and then bought me baseball gear and took me to a sold out baseball game where I got my favorite players autograph. Not the most romantic date we've been on, but definitely the most fun! I stopped by High Heeled Life..loved her post on friendship. Also stopped in Going the Distance..she kinda looks like the new princess Kate! This is my first time at Mingle Monday and I tweeted about it too @Wanderingheart7. I haven't been on a date in awhile, but I love dates where the guy cooks for me. I think it's just so sweet and casual and it's a good time to relax and get to know each other. I love when Mr. G cooks a wonderful meal and we sit back and relaxing after an exhausting week ... thats our date night. I love zoo dates. They're my favorite. I visited A Little Bit of this and That. She has an absolutely adorable design! I also visited Going the Distance.. We both saw Water for Elephants this weekend! I love her 1001 Things to Love! Super cute panda coffee photo. I adore her layout design. And her proposal photo in her Love Story, part 4 is too precious. I think I'll be following here! I visited summer dreams first - love her pretty and simple blog design! Then I visited On the Front Porch Looking in. Great yellow and grey ideas! I read Ken or action Man? A post about how our childhood experiences shape us as adults. Finally, I stopped at Love, Julie. She is looking for advice on what to spend money on vs. where to save. Stopped over at Bring The Rain...She has an amazing blog! And she lives in the same town I lived in for a year in 2010! Too cool! Also stopped at Falling off and High-heeled life...love the title of her blog! I visited Life with Laura and read about the sweet surprise she found from her grandma. It was touching. Bring the Rain had a great post about some of the recent current events, and a post last week about living in the South that made me want to pack my bags and drive to Mississippi right now! Dance and Dream has pictures of the most amazing invitations that I *need* for my bachelorette party. Seriously, go check them out!